Now that we are in October it at last feels as though the proper jumping season is about to begin. We have had a very quiet summer racing wise as the ground has been so hard and I did not want to risk the horses on it. There are some dreadful stories of injuries due to the going so I am very glad that we took that decision. Nevertheless we have been very busy with the usual summer yard jobs and backing some very nice store horses. We have also had a brilliant change of staff and have the best team that I have ever had. It is very refreshing to have enthusiastic, knowledgeable and happy staff who enjoy their job, work as a team and want the yard to succeed. What a change! On the horse front we have some very nice new additions to the yard, and some new and returning owners. 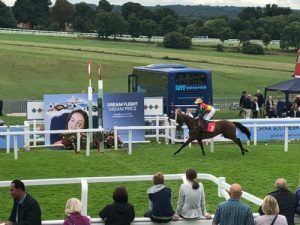 Jockey wise we have the services of some of the best in the business such as Aidan Coleman, Nick Scholfield, Daryl Jacob, the Bowen brothers and Tom Scudamore. Alex Chadwick, Dickie Collinson and William will ride the point to pointers and in amateur races. 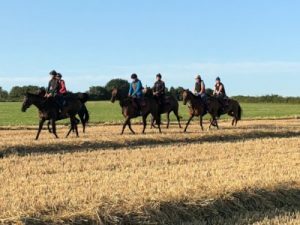 If you would like to be involved in racing at a very reasonable cost why not join Yen Hall Farm Racing? This is a racing club that will have horses running on the flat and over jumps under rules, and horses running in point to points. On top of that there maybe the odd trip team chasing which is fun, but heart stopping, as well as schooling mornings and plenty of hospitality. If that is not enough, William will also be starting his career as a jockey and will ride when the races allow, so it will also be an opportunity to follow the ups and downs of becoming a jockey and he will give insightful views on his rides and his progression. There will be five horses in the club ranging from older handicappers to young maidens starting their careers. The club will run from November until the end of May and will cost £165 per month. At the end of this period all owners prize money won will be distributed between the members. With five horses involved there will be plenty of racing and it is excellent value for money. If you would like more details about joining this exciting club please contact Sarah at sarah@yenhallfarm.com. I look forward to hearing from you.